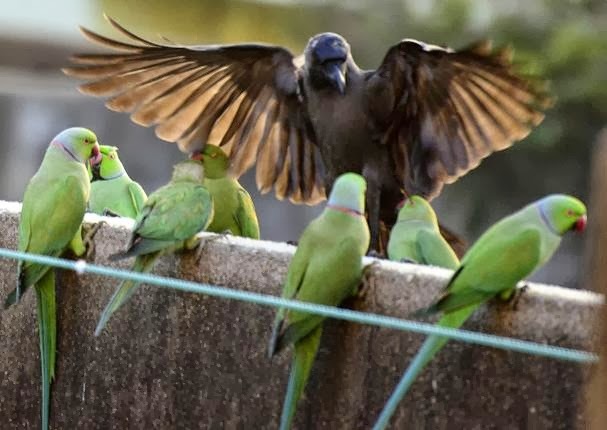 Maradhi Manni: Keech...Keech...Beware...Parakeets Are Visiting....! 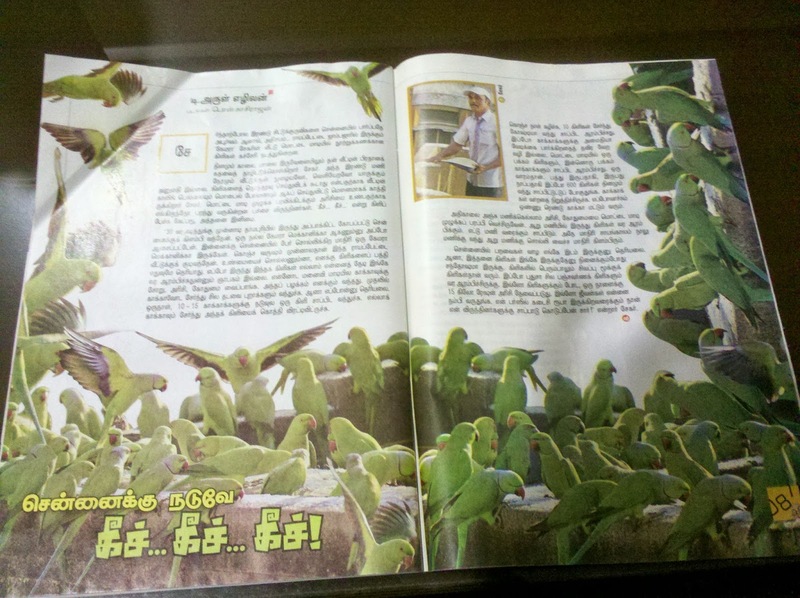 As soon as I saw the picture of parakeets and so many of them in a small area in the city centre, in the Tamil magazine Aananda Vikatan, I decided to preserve the article in my blog. All of you know how crazy I am about birds and animals. Then I searched the web to get more details of this news and got it. It is here, in The Hindu dt. 12th June, '13. As we know already, we rarely see small birds like sparrows in the crowded cities nowadays. Even crows are becoming less in number, I was told. When I went to our old house, which was in the outskirts then, 17 years back, I used to see these birds visiting our house for the seeds of the Rathnagandhi flowers. They used to split the beans like seeds and eat the seeds which are inside and leave the outer skin on the ground. Whenever they visited, the whole garage area was full of these skins. I was not writing blogs in those days (!) and so it never occurred for me to take pictures of so many of the birds. But I used to stand there and watch them. I don't see them anymore now. The bulbul birds are also gone. The bulbul birds were like family for us. His wife had the habit of keeping rice, wheat, fried gram etc. for the birds on their terrace. Crows used to eat the grains. Sometimes pigeons joined them. Around a year back, one day a parakeet (Kili in Tamil) came to eat the grain in the midst of 10-15 crows. But the crows pecked/bit the lone bird and it flew away. After a few days around 10 parakeets came together and started eating the grains which were kept on the parapet wall of the terrace. For around one week the crows sat in one corner and ate the grains without 'disturbing' the new guests who started feeding on the grains on the other side of the wall. 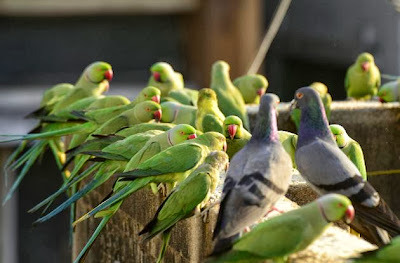 After a week, slowly, the number of parakeets increased from 10-15 to 20-30 to nearly 200 now! Very rarely one or two crows join them nowadays! He gets up at 5 am and spread wheat and rice on the terrace and comes down, closing the door. The parakeets start coming around 6 am and eat until nearly 8 am. Likewise they visit from 4 pm to 6 pm in the evening. He needs around 15 Kg. ration rice everyday to feed them. He is very particular not to disturb them when they eat. Nobody is allowed to ring the doorbell when they are fed (though everybody knows the 'bird feeding' time now!). He tried to feed some fruits, but they are smart. It is easier for them to gobble up the grains than fruits. They eat very fast, he says. Nowadays he sees multi-coloured parrots also sometimes. He says that he will feed them as long as he live. He says he is blessed to have them as guests in a house which is surrounded by vehicular traffic and blaring sounds. A few pigeons are sitting along with the ring-necked parakeets! This picture is beautiful....the parakeets don't seem to be scared of the crow! This is the man whom I admire, Sekar! Look at the buildings in the background. The area is full of shops and you can imagine the vehicular traffic in this area! I am keeping on looking at the pictures...I am so happy to see them. One day, I should try to visit this place. But, I don't want to disturb the birds. Just would like to meet this great man! Wonderful pictures. Rare to see such a large gathering of Parakeets and that too quite fearless of the menacing crow. Thanks for sharing your great enthusiasm. RAMAKRISHNAN RAMANATHAN: Another 10-20 years and we won't see them at all. Poor birds. The trees are absconding and fruit bearing trees are not to be seen at all. How will they survive. I had a guava tree in my old house and most of the fruits were eaten by squirrels. We loved to watch them eat! Tiny birds need nectar to survive and the flowering plants are replaced by croton plants nowadays! Thanks for commenting first, Ramakrishnan! The pictures are beautiful, more so because of the parakeets. I too miss the sparrows, parakeets that came and sat on the big tree in our house, the pigeons, the cuckoo calls and many small birds. A pleasure to read this and also enjoy the pictures. Good sharing for memories of my childhood days. Wow! beautiful to see the green carpet on that terrace. The crows look so sad! Thanks for sharing these beautiful pics and the article, Sandhya. This is the right way to treat birds - There is no point in locking them up in cages. Birds are living beings and are not decorative pieces. I hate people who lock up living things like that. Thanks for the nice write up and wonderful photos. Rare to see so many parakeets in one place. With his cap on, Mr. Sekar looks like Mr. K. Bhagyaraj. Beautiful pictures and great to see so many parrots in one place! The name 'Camera Sekar' cracked me up! haha! Wow amazing man, amazing story! Those parakeets and parrots are lucky to find this nurturing soul. GOURI GUHA: Thank you, Gouri! I wonder if our next generation would be able to show these birds to their children. No bird sounds would be there in the mornings. SUSAN DEBORAH: Thank you, Susan! DESTINATION INFINITY: This man is a great person to spend so much time and money for these living beings and he does it lovingly. SG: Yes, you are right, SG! He does look like Bhagyaraj! ASHWINI SRIRAM: Hmmm...I didn't notice the 'camera' Sekar thing! He can keep on taking pictures of the birds, if he wants to! We can see he loves these birds and wouldn't do anything to disturb them. RACHNA: Yes, they are. Very rarely people spend time for the tiny little birds, even to admire them! It's a set of lovely pictures. Wait for another few years,watching such lovely birds will go into history books. Also, that man is doing a wonderful job, nowadays people don't have enough time for tasks in their own life. He is taking out the time, effort and money to feed the beautiful birds, excellent!! When I read about this in Hindu metro plus, I felt surprise as same as you! I truly amaze where all these bird comes from when seeing one itself a rare scene these day. In my early house in apartment, I used to see Parakeets perching the Camachile tree for fruit. Sandhya the article and the photos are amazing.Thank you. I have never seen so many parakeets at one place.Too good. So refreshing, and indeed a sight for sore eyes! God Bless this wonderful man! My elder sister in law has a collection of such bird friends who visit each morning for her offering; she says the number of different birds is really amazing! BK CHOWLA: Yes, Chowlaji! Many people don't even think in that line! SAI CHARAN: I admire his family too for appreciating his love for birds. He must be spending a good share of his income for this purpose. Really, a great man! JEEVAN: I just wanted keep this article and pictures in my blog! We can do only this. RENU: Our new building has got some nowadays, though they haven't started coming into our balconies. Yes, they do dirty the places where they go. Their excreta corrodes the metals. The only bird I don't like is, pigeon and the animal is hyna! USHA MENON: No, we will never see. This man is lucky, he is watching them everyday. Seeing a lone parakeet itself is a rare thing. We can see them only in the zoos and they are caged. USHA PISHARODY: Your sister in law is lucky. She must be very happy feeding them, which is very good. We must do these things. I get only crows in this house. But I feed them and watch them eat. Such a nice information about the parrots and the camera man. The pictures are also great. Maybe you would meet him one day. Such a sweet post Sandhya...The pictures are lovely...i saw parakeets in zoo never in residential areas...I know how happy you are after reading this article in the magazine. RAMA ANANTH: Yes, I have to meet him one day. VARUNAVI: Yes, I was very happy to see the pictures and wanted to store it here! Write small small posts sometimes, I know you are busy. This will relax you a bit. Like hundreds of millions of pigs around the world, his life was predetermined to be a mere commodity as an animal for human consumption. But for this piglet, that all changed as he lept from a moving truck on the way to the slaughterhouse. RAHUL BHATIA; Yes, he truly is a great personality! ONKAR: Yes! Thank you, Onkar! Lord Ganesha Temple Car In Our Street!